Home»Promos and Oversized Cards and More! Promos and Oversized Cards and More! This update is about a lot of things! 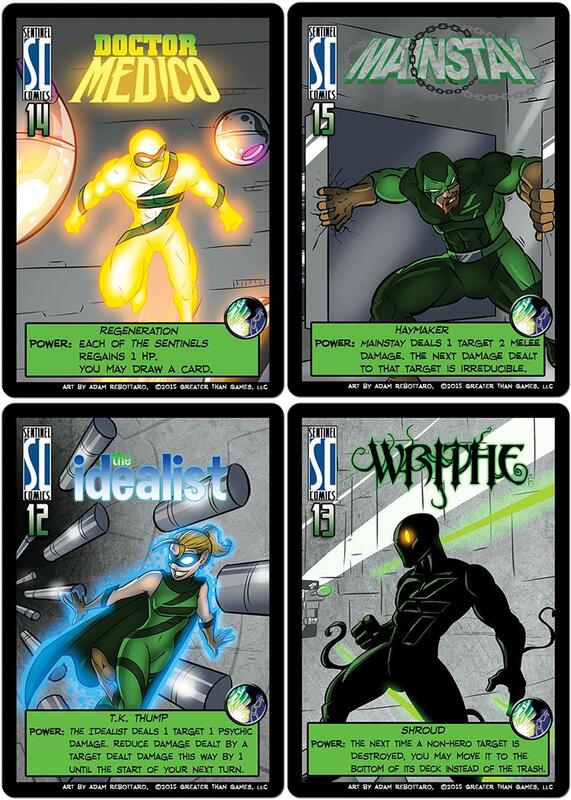 First off, here are all of the promo cards that you get for preordering Villains of the Multiverse! John Rhodes has learned far too much and seen too deeply. He now acts as a gate between reality and the infinite void. He cannot protect himself, but can he protect his allies from what is yet to come? Those hunting Michael have drawn ever closer. It's only a matter of time before they catch him. Cornered as he is, The Naturalist has been losing his grasp on his humanity, struggling to maintain focus as keep a single, stable form. Jim was stranded outside time after his chrono-badge got busted. It was hard to tell how long he waited, but when the nice, silver-haired lady in the pirate ship sailed by and offered him a ride, he was right pleased. The folks on the ship fixed up his arm and his badge, and the captain of the ship just asked for one simple thing in return: fix the mistakes of her youth. Apparently, she'd made a mess of things when she first got that ship, and she was depending on Jim to set things right. Fair enough. He was good at jobs. Training together as part of the Hero Project in Fort Adamant, The Sentinels have honed their skills and become an even stronger team. The last few years have been difficult, but those hardships have brought them together. Nick, Jackson, Miranda, and Eugene are the heroes of the future! Also, I'd like to show you something really cool. 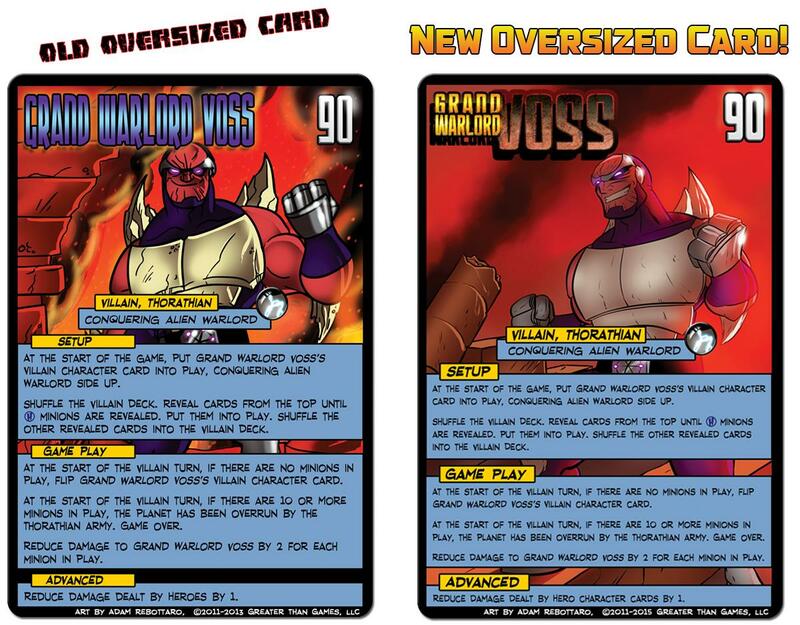 Here are some comparison images showing the differences between the old Oversized Villain Cards and the new Oversized Villain Cards. They're really awesome. That's right! 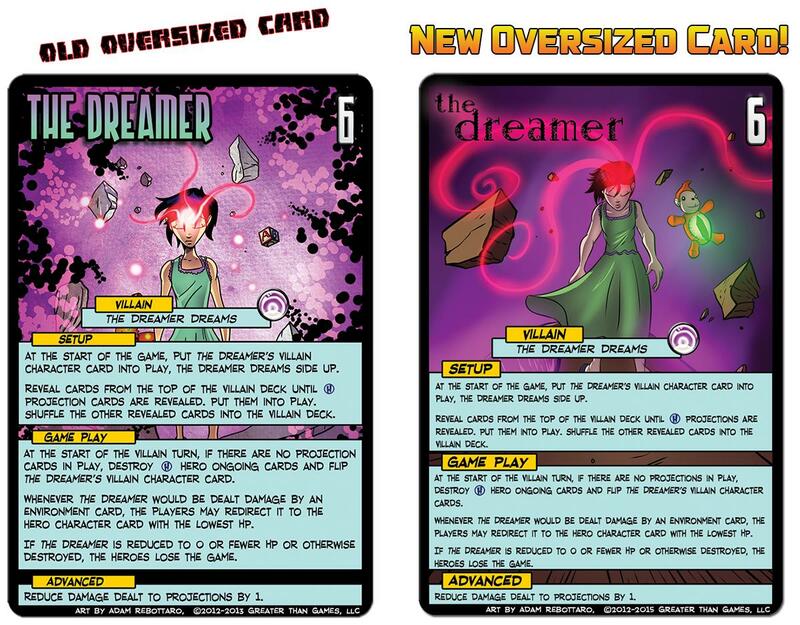 All of the new Oversized Villain Cards will have brand new art by our own Adam Rebottaro, as well as cool villain name titles! Plus, the general graphic design has been cleaned up well by our Graphic Designer, Jenn. I'm thrilled with how well they turned out! Last, but certainly not least, we have the two alternate character panels that come as promos for buying the For Profit expansion to Sentinel Tactics. Ambuscade has used all manner of tech before to hunt his prey, but he derives the most pleasure from hunting using rudimentary tools. 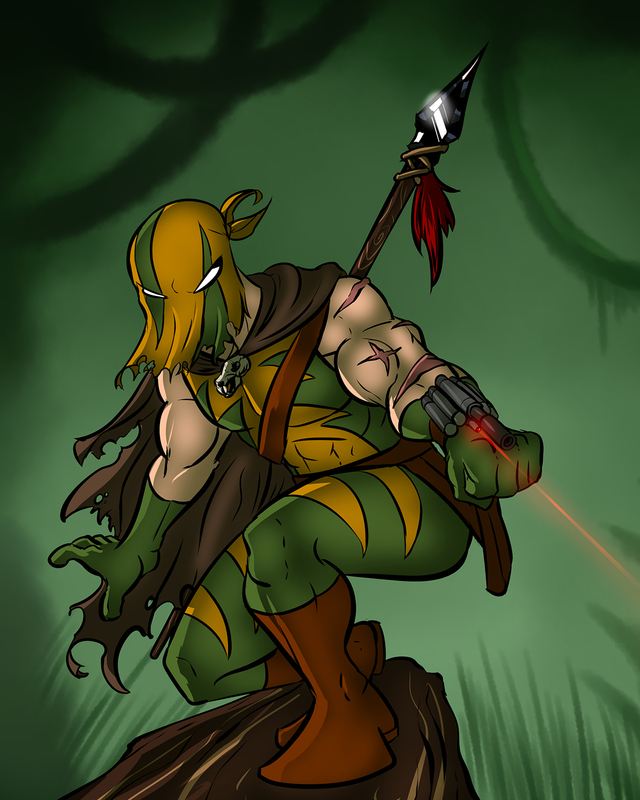 His neuro-toxin darts are for slowing down his foes, but his hand-made spear is his favorite weapon, and he wields it gracefully and gleefully. Working with For Profit means a more straight-forward approach for The Operative. She does enjoy singling out a target and going toe-to-toe with them, and taking them down. 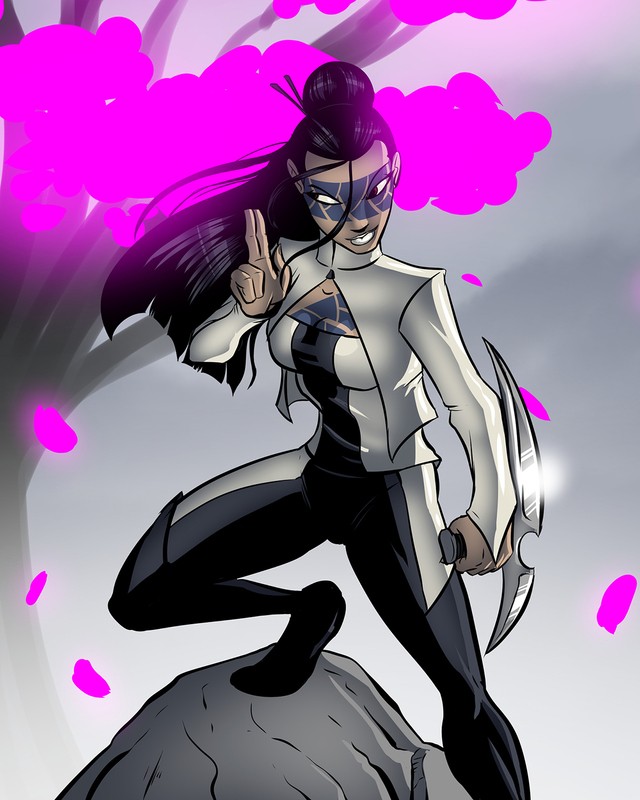 She still has a leadership role in For Profit, as someone experienced should be organizing the heists and such, but once battle breaks out, she gets to let loose on her opponents. There are still two weeks left in the preorder campaign! Also, if you're interested in adding anything to a pre-existing order (such as Dice Hate Me Games products, which are now available as a result of today's merger announcement) just e-mail Craig at Craig@greaterthangames.com and he can help you out! With so many great game products, how can you go wrong? I love the subtle S on each of the Sentinels' uniforms, very cool! Looked like a 4 to me initially. While it makes more sense to be a S it could easily be a combination. Dawn will not be a fan of Writhe in this form. I'm curious if the promo sentinels can mixed with the original versions and if there is a new setup card with new incap abilities. Can't wait to get these promos and play them. Seeing a preview of the Oversized Villain cards makes me glad I've added them. And now, it's all but spelled out that villain-team La Capitan will be Chrono-Ranger's nemesis: An older, wiser, and possibly remorseful Maria Helena asked him to travel back and stop her younger self, hoping to preemptively repair the damage she does to the timelines, which infuriates the younger, tempestuous, and rather shortsighted version of La Capitan. Interesting to find out that his sheriff's badge is the key to his ability to travel through time! Another gift from Con? I don't remember anything that pointed to his badge as the device enabling this ability, but I'm not as steeped in Multiverse lore as many others. I think his incap side shows a broken badge with gadgetry in it? Box is elsewhere at the moment or I'd check. It's him sitting at the edge of time, his badge is on the ground throwing off a spark. I don't believe a promo setup card is coming, I believe they would mix and match, although they are designed to work together. His power reads "All bounty cards". For the sake of completeness, should it have "in play" added to it? That's seems to be the implication, but I know from teaching my friends that sometimes the separation between in play/in hand is a fuzzy enough concept. Love the new looks! 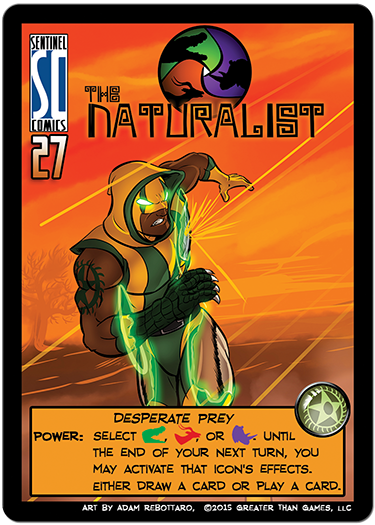 Excited for a potential double-icon Naturalist with a form and promo power in play! So if you use CR's new power and the original target of his bounty is destroyed before the power wears off, the bounty will stick around after the power fades until you forcefully remove it with ongoing removal or JIm's hat, right? That doesn't seem to be the intent, but it certainly seems to be the way it's written. And certainly if both targets are destroyed, this would be the case (a "floating" bounty with no target). 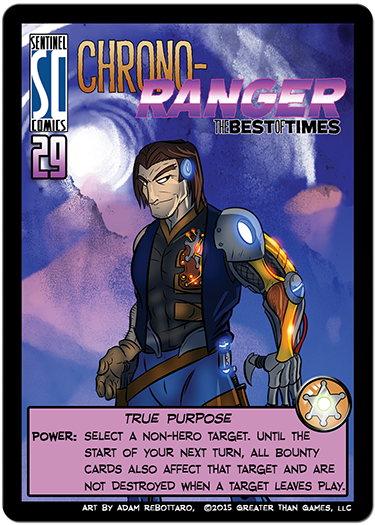 Which isn't necessarily the worst thing--if you keep using the power, it could even be advantageous, especially for villains like the Dreamer or the non-target sides of Kaargra and Miss Information. Hoping for special minis of the alternate Ambuscade and Operative. I thought there were suppose to be 18 promo cards? 18 promo cards were for the Sentinel Tactics expansion. 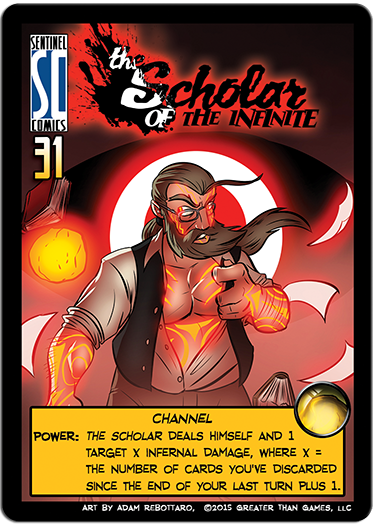 For the SotM expansion Villains of the Multiverse there are only seven. This explains the Voss drawing on Adam's twitter a few days ago. I've been wondering this since I got my Wrath of the Cosmos pre-order w/o oversized villain cards. Is the only way to get the oversized cards for WotC to buy the new pack? No chance of a half-pack just covering WotC and beyond? Yes, there will not be a half pack. A recent interview for a full-time job didn't turn into an offer. As such, I'm not going to be in a position to order Villains before the preorder closes. 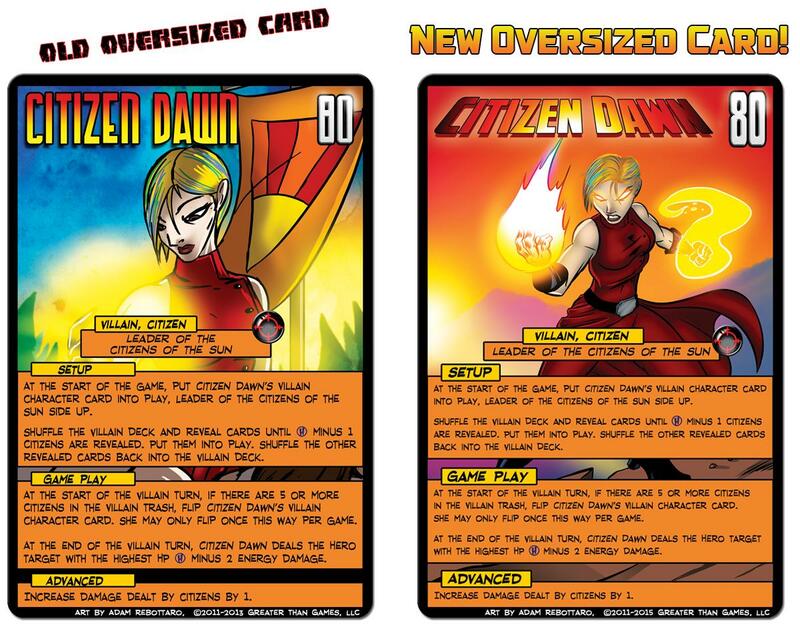 Will hero promos still accompany orders of only the oversized villain cards? Same question (thoughI believe the answer is 'no'). I already own the original oversized pack and while the new artwork looks really good, I can't justify buying the new pack unless it came with the promos. You would get promo villain cards but not the heroes. Only preordering VotM guarantees those hero promos. While I love a good teaser as much as the next guy, when do these actually ship? Smaller font on oversized cards? As much as I love the new art on the new oversized cards, why is the font smaller while taking up the same amount of space? With these images on my monitor (and without seeing the cards themselves), I find the new text actually rather hard to read from just ~3 feet away (ie: from my chair), while the old text is perfectly legible. Since the spacing between the words is much greater on the new cards, no visual space is saved by shrinking the font either. So, if the intent of shrinking the font was to show off more of the cool new art, the spacing should be shrunk as well as the font (looks like the same spacing as for the bigger font, just with smaller letters). If the intent was to make it more legible, for me, it does not achieve this, at least, not on screen.